If the door is locked, knock on the wooden dutch door to the right. Leave your driver’s license at the office and in return you will receive a key to the camera obscura at the top of the stairs. 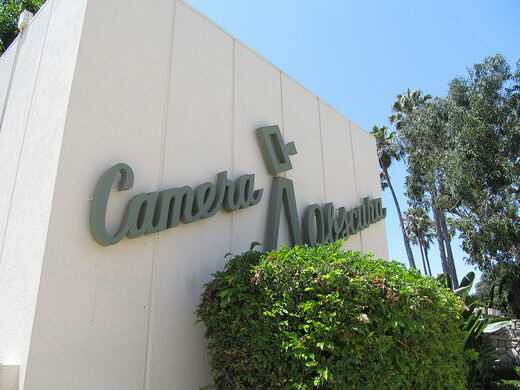 It’s housed in a midcentury park building that is also an art and culture center offering classes and events. Inside a small room you will find a large white disk in the center and a wheel that allows you to steer the lens and mirror contained in the turret above, projecting an image onto the disk of whoever and whatever happens to be passing by outside. 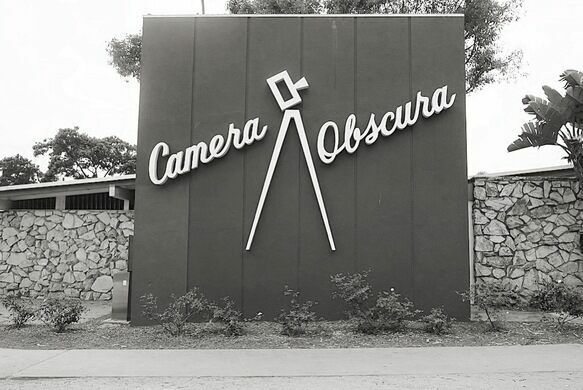 The camera obscura is believed to be among the earliest optical inventions, theoretically dating back at least to the ancient Greek era. Academics believe camera obscura devices may have been used by Renaissance painters such as Leonardo Da Vinci to project live images onto canvases to help them paint, and in Victorian and Edwardian times they became a popular seaside attraction in both Europe and the US. 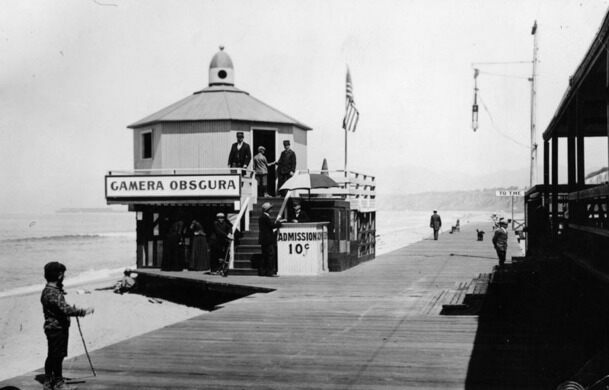 Such was the case with the Santa Monica Camera Obscura: Built in 1898 by Robert F. Jones, and given to the city in 1907, the camera spent almost 50 years documenting life on the Santa Monica beach. 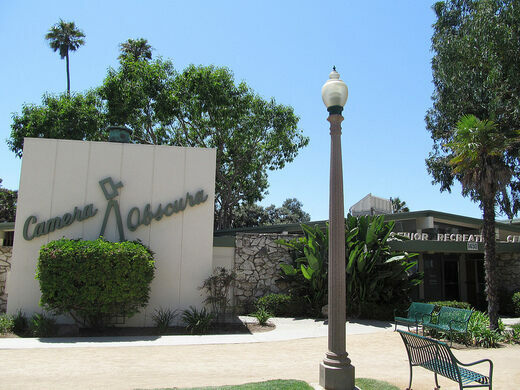 In 1955 the mechanism was installed in the nearby Adult Recreation Center, now a City-run art lab. 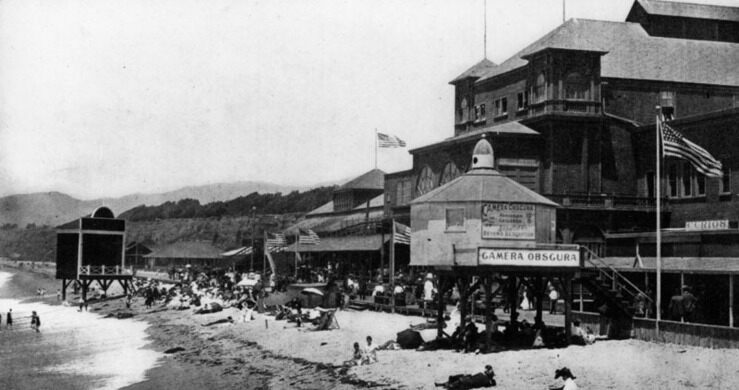 Many images of the popular beach community throughout the years are on display to compare to the current view. 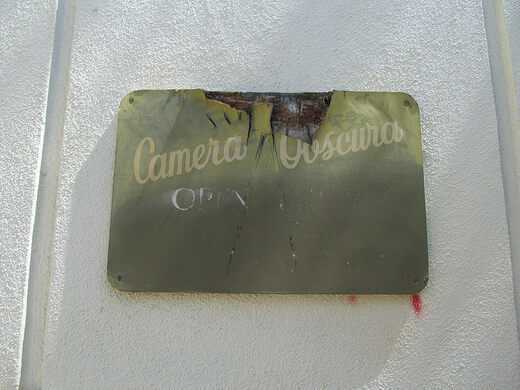 Once such a common beachside attraction, there are now only a handful of functional public camera obscuras in the US. 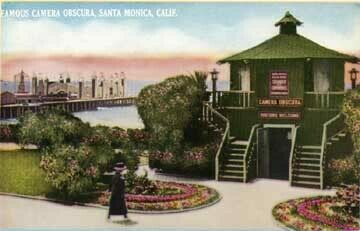 Just a quick walk from the pier the Santa Monica Camera Obscura remains a little known treat for those interested in photography, 19th century mechanics, or spying on oblivious beach-goers. In Palisades Park just north of the Santa Monica Pier at Ocean Ave & Broadway. Parking at Structure 6 on 2nd street around the corner or at the Civic Auditorium lot down on Main St. It's closed on Sundays. 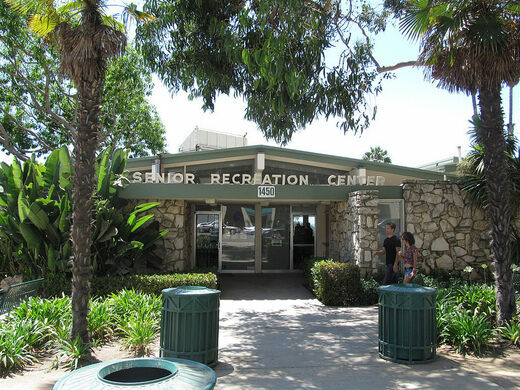 Senior Recreation Center, 1450 Ocean Blvd. One of the first skyscrapers in Santa Monica, and a famous getaway for the Hollywood elite of then and now.